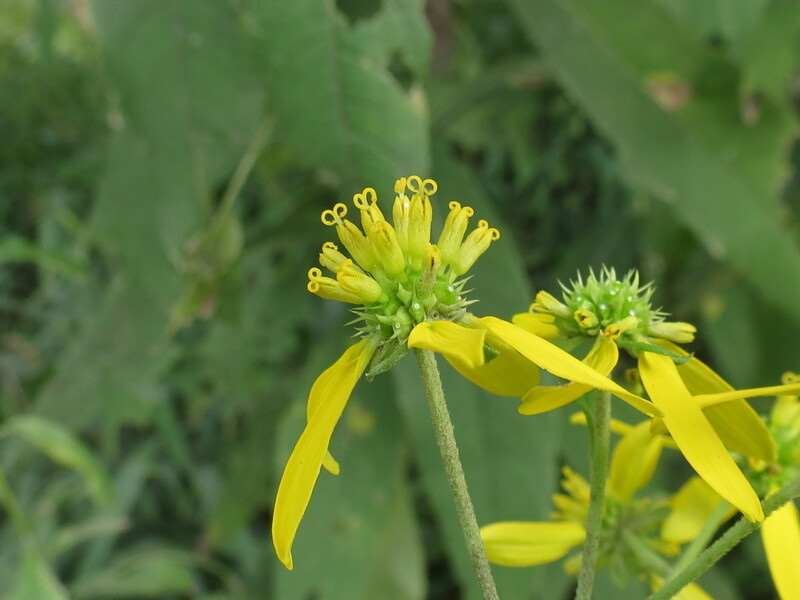 Verbesina occidentalis (Crownbeard) is arguably one of the most visible flowering plants in North Carolina. The tall stems and yellow blooms of this native perennial are hard to miss due to the sheer numbers of plants blooming. Crownbeard seems to be everywhere: in urban lots, suburban parks, and rural fields, ditches and roadsides. Crownbeard is a tall plant, often over 6 feet, and has a very distinct, disheveled, almost ragged bloom. The bright ray flowers are sparse and are not uniformly placed around the disk, making the bloom look uneven and out of balance. 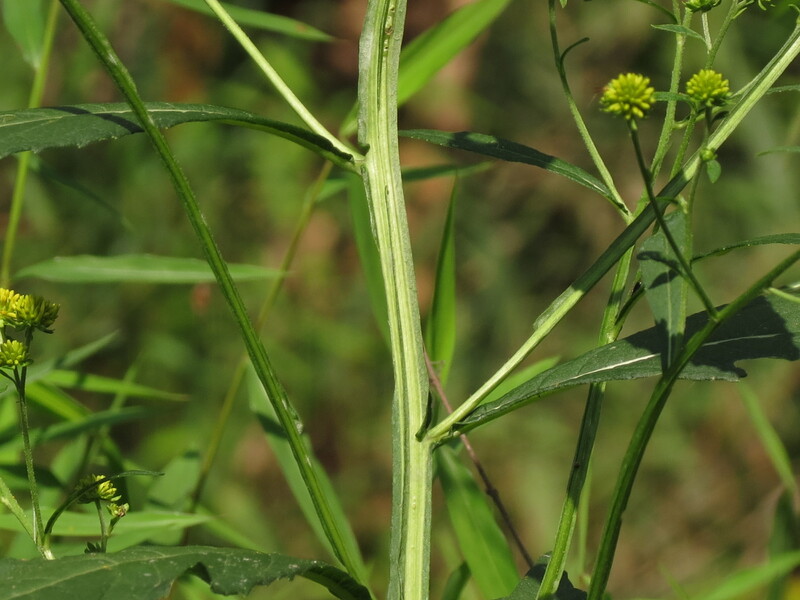 Crownbeard has a distinctively winged stem and opposite leaves. See the photographs below of the flowers and the opposite leaves and winged stem. Verbesina alternifolia (Wingstem) is a close relative of Crownbeard and also has a distinctive winged stem, but its leaves are alternate. It too is found in large numbers in central North Carolina, but it prefers wetter soils and tends to occur near rivers and streams. 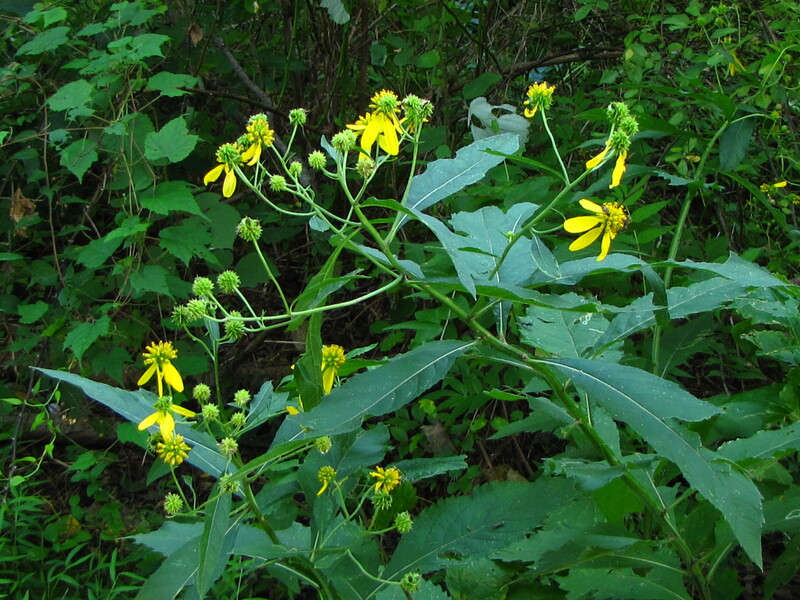 However, Crownbeard and Wingstem sometimes appear together in powerlines and ditches. From a distance, they look very much alike – tall stems and bright, yellow flowers. But they are relatively easy to tell apart. 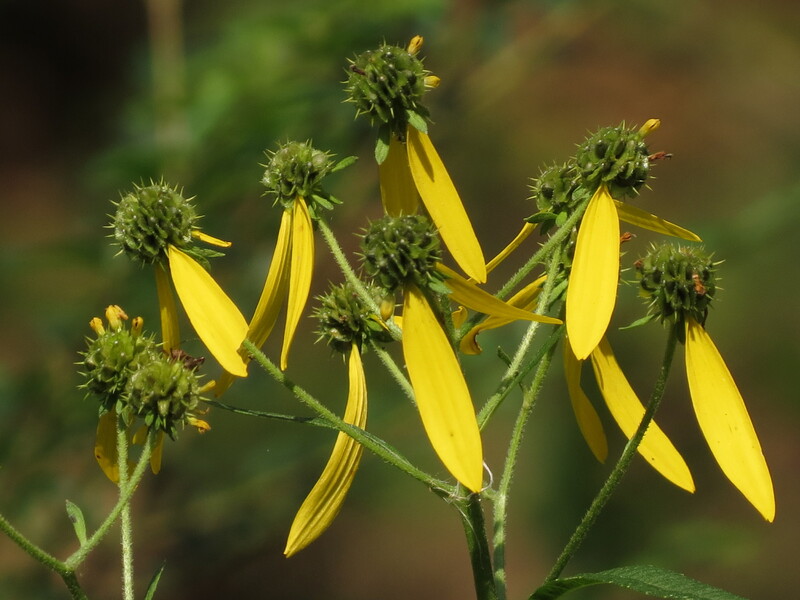 In addition to having alternate leaves, Wingstem also has a distinctive flower that looks a lot like the Green Headed Coneflower – Rudbeckia laciniata. The center of Wingstem’s flower becomes prominent, while the ray petals gradually droop, giving it a coneflower-like appearance. See below. The disk flowers have fascinating curled, bifurcated stigmas, as shown below. In older flowers, the rays droop even more and gradually hang straight down. 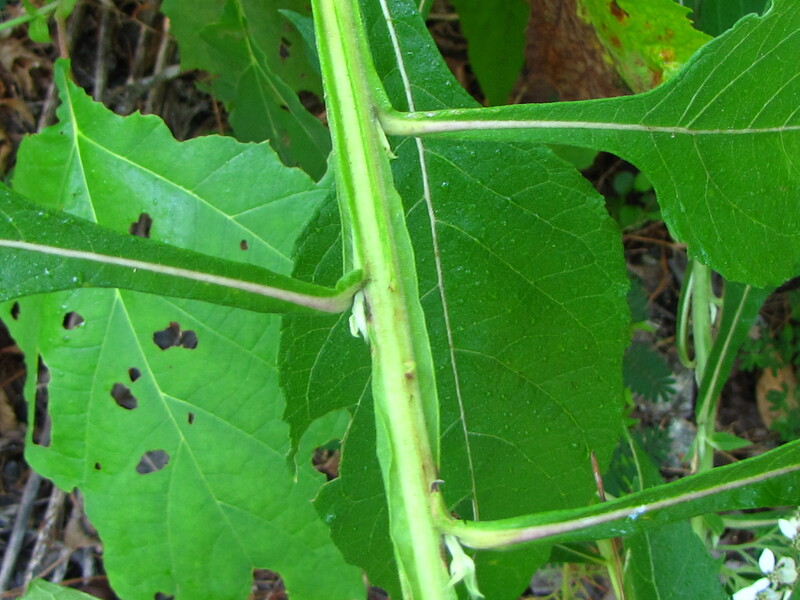 The alternate leaves and winged stems are shown below. 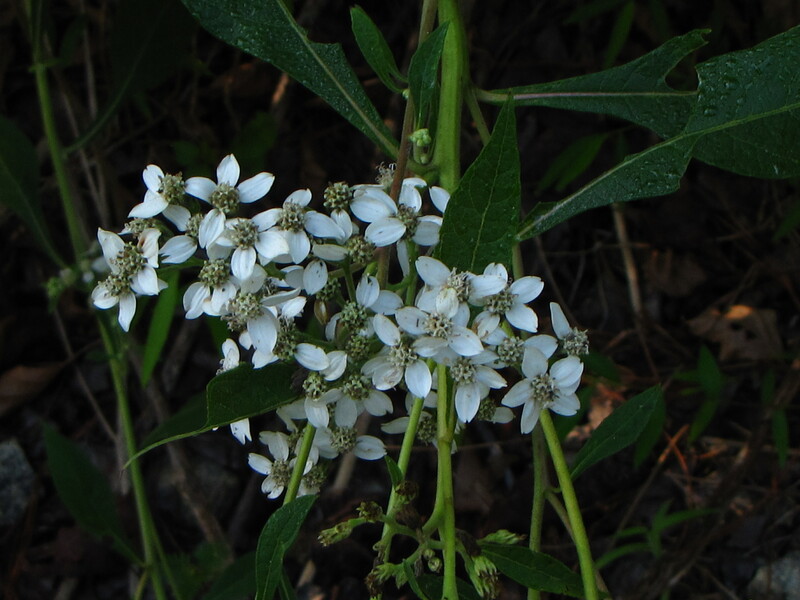 A third close relative, Verbesina virginica (Frostweed), is very similar to Wingstem, as both have a winged stem and alternate leaves. It is much less common than Wingstem and Crownbeard in central North Carolina. 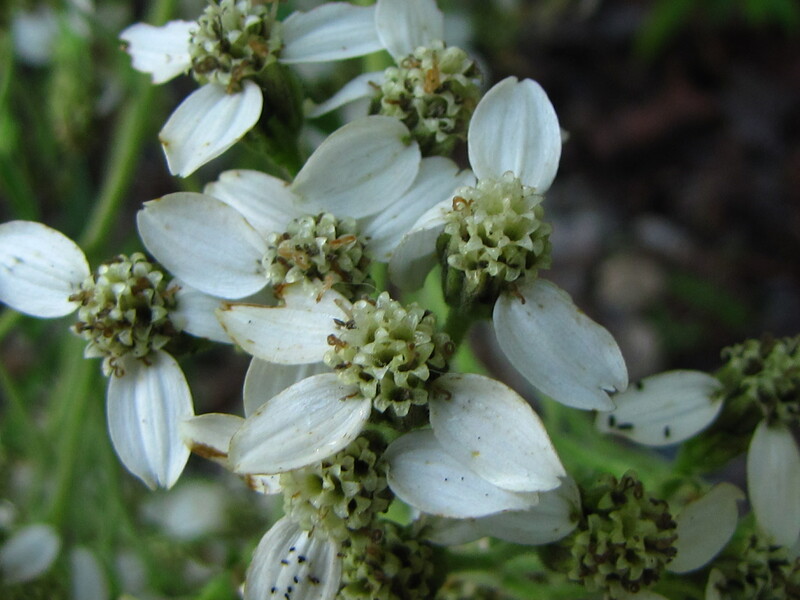 Frostweed is easiest to differentiate when it blooms, since its flowers are white rather than yellow. 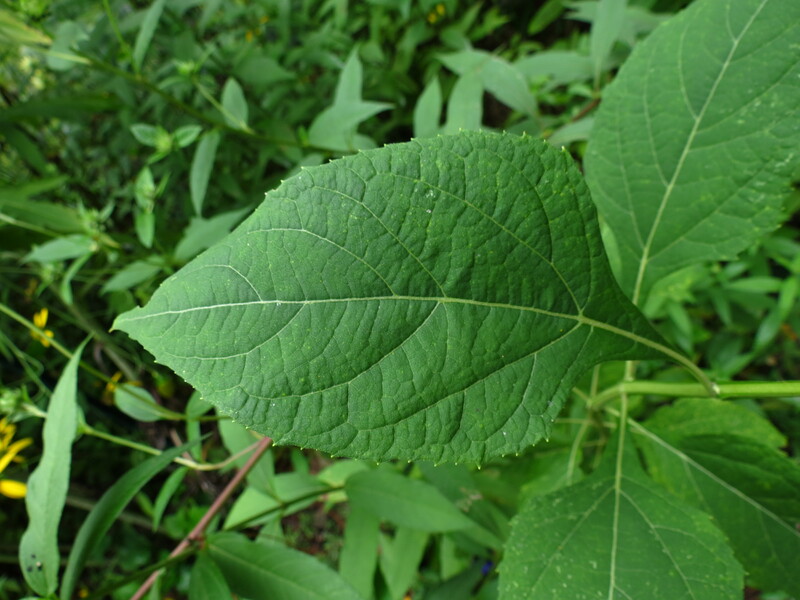 Pictured below are the alternate leaves and the winged stem of Frostweed. The wings of all three plants are formed by the continuation of the leaf petioles down the stem. 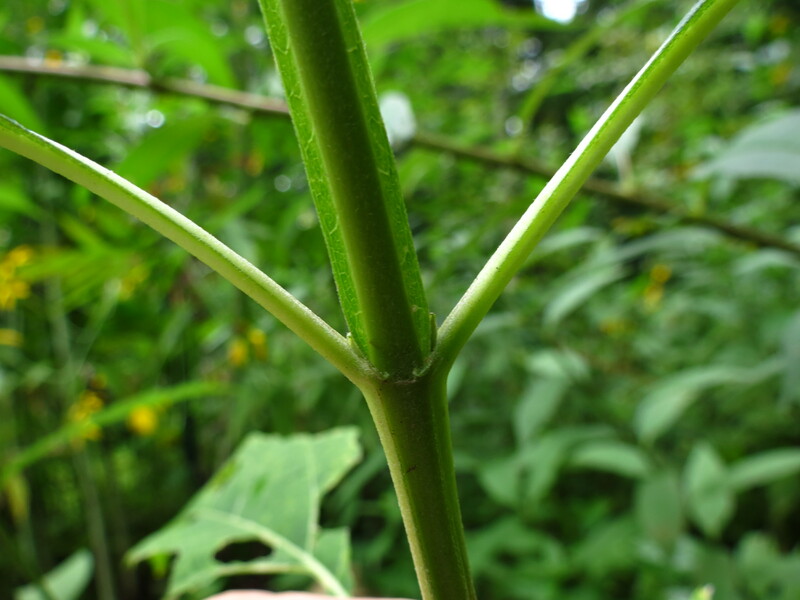 Petioles are the stalks that attach the leaf blade to the stem. The petioles can be seen forming the wings in the photo below. Frostweed has another fascinating property, one that is very rare. In winter, under the right conditions of an overnight freeze, the protruding stems of Frostweed form ice sculptures as freezing water is extruded through the fibers of the stem. This phenomenon has been popularly called crystallofolia. These natural ice sculptures are amazingly beautiful and can be seen in the links below. 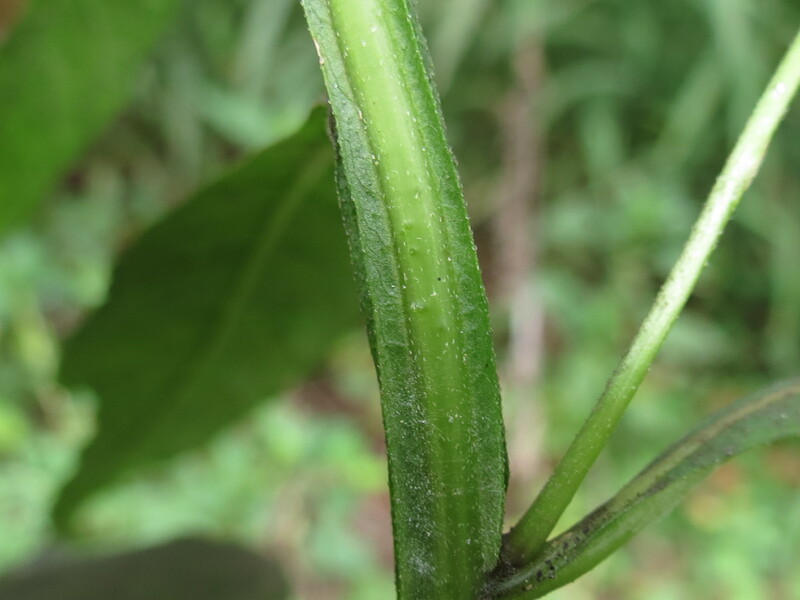 This entry was posted in Uncategorized and tagged bifurcated stigma, Crownbeard, Frostweed, leaf petiole, Verbesian occidentalis, Verbesina alternifolia, Verbesina virginica, winged stem, Wingstem. Bookmark the permalink. 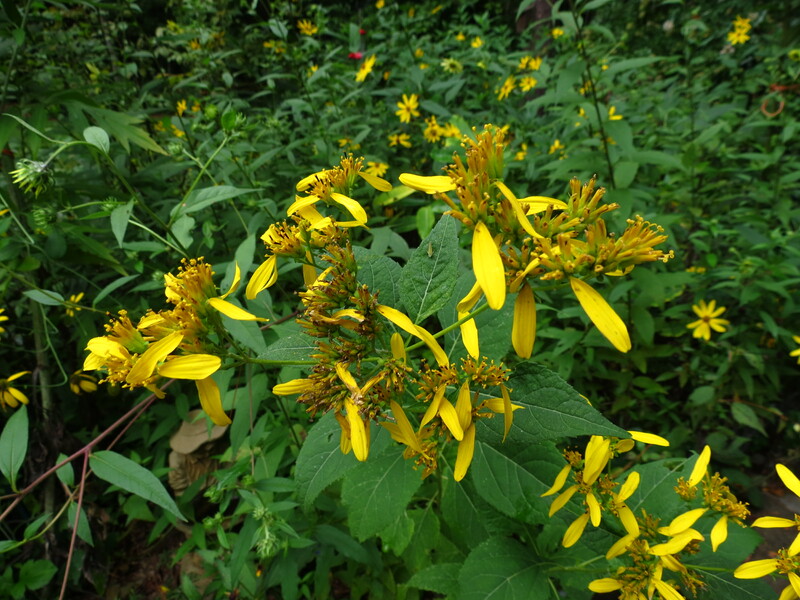 So glad to read about crownbeard, Herb. It is all over the meadows at Joyner Park and is so dense, that some areas are almost solid yellow. Plus, there’s a very rich, autumn smell that emanates from the dense patches. I did not know about wingstem or frostweed, but I will be on the lookout for both, especially the former. FYI: about a month ago, while walking on the Falls Lake Trail between Rolling View and NC 98 (maybe .5 miles from the road), I came across a single, unfamiliar plant that I knew was some kind of orchid, based on its thick, shiny leaves. I didn’t take a picture (no camera), but upon my return home, I pored through my Bell and Justice *Wildflowers of NC* book and believe what I saw was a *Lily Leaved Twayblade*. This picture, googled from the Internet, seems to mirror what I saw. While I was thrilled to see something “new,” I was disturbed that I saw no other plants like it…just that one, right beside the trail. No nearby colony that I could see. How does this solitary existence happen?